The What: Blackmagic Design will demonstrate Blackmagic MultiView 4, a new multiviewer that lets customers monitor four completely independent SDI video sources on a single display, at its booth SL217. The What Else: With Blackmagic MultiView 4, customers can monitor any combination of SD, HD, and Ultra HD formats and frame rates all at the same time. MultiView 4 can output to regular HD monitors; however, when customers plug in an Ultra HD display, they will get four times the resolution of a simple HD only multi viewer. Blackmagic MultiView 4 includes four completely independent multi-rate 6G-SDI inputs with separate loop-through outputs that are compatible with existing SD, HD, and Ultra HD equipment up to 2160p30. All inputs feature automatic frame re-synchronization, so customers can mix and match any combination of video standards and frame rates, including referenced or non-referenced NTSC, PAL, 720p, 1080i, 1080p, and Ultra HD up to 2160p30, all on the same display all at the same time. Designed to be plug and play, customers can simply connect sources and instantly see a standard 2x2 layout on an HD or Ultra HD television. Using the included ethernet remote control software, customers can turn on audio meters, choose which audio to output, as well as create custom labels, and more. Blackmagic MultiView 4 is also compatible with the optional Teranex Mini Smart Panel for customers that need to add front-panel controls. 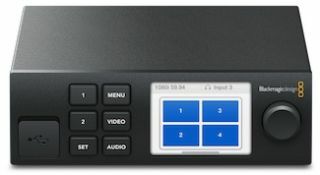 For the ultimate in broadcast reliability and redundancy, users can even power MultiView 4 via the AC connection as well as power over ethernet. Blackmagic MultiView 4 is designed using the same compact enclosure as Blackmagic Design’s Teranex Mini converters, so they are small enough to be used in fly-away cases, outside broadcast vehicles, housed in equipment racks, or even sitting on a desktop. They are only one-third of a single rack space wide, so customers can mount them on the optional Teranex Mini Rack Shelf side by side with additional MultiView 4 or Teranex Mini products. The Bottom Line: Blackmagic MultiView 4 is designed for live production, on set, in control rooms, or any place where space is tight and customers don’t have room for extra monitors. Customers no longer have to connect multiple monitors, dozens of cables or run extra power. They simply plug in cameras, decks, switchers, routers and feeds into the SDI connections on Blackmagic MultiView 4 and can see everything with amazing clarity and detail on a single HD or Ultra HD display.